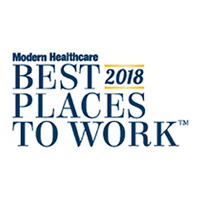 Medicus Healthcare Solutions has been selected by Modern Healthcare as one of the 2018 Top 100 Best Places to Work in Healthcare. Winners were chosen based on an employee survey, as well as a comprehensive employer questionnaire. Topics of interest included diversity, employee bonus and incentives, benefits offered, sustainable or green practices, career development programs, communication tools, employee appreciation efforts, and much more. The complete list of this year’s 100 winners, in alphabetical order, is available here. A ranked order will be revealed at an awards dinner, September 27, in Dallas during Modern Healthcare’s Workplace of the Future Conference. Winners will also be featured in a special supplement published along with the October 1 issue of Modern Healthcare. Organizations making this year’s list of Best Places to Work in Healthcare stand out in their efforts to create an empowered and satisfied workforce.